Allow me to begin by congratulating you on your assumption of the Presidency of the Council for the month of March, and expressing appreciation for convening this important meeting on the situation in Afghanistan. Today’s meeting, which takes place just less than a week after the appointment of a new Special Representative of the Secretary General to Afghanistan, and days prior to the Council’s extension of UNAMA’s mandate, offers a good opportunity to discuss the situation in Afghanistan. We congratulate Mr. Kai Eide on his recent appointment and wish him every success in fulfilling the task entrusted to him. We look forward to working closely with him. We are thankful to the Secretary General for his recent report on the situation in Afghanistan. His report is comprehensive, covering a wide-range of issues, including key political developments, the security and humanitarian situation, and the future activities of UNAMA. Increased terrorist attacks by the enemies of Afghanistan have led to some ill-judged and misguided perceptions about the situation in the Afghanistan. Recent remarks of government control or even failure in Afghanistan are products of premature assumptions which have the potential to undermine public support for efforts to achieve lasting peace and security in the country. We should stay the course with firm determination, and prevent security nuances from weakening our resolve to achieve our shared goals. Let us not forget that we, Afghanistan and our international partners, have made undeniable gains towards a strong, stable and democratic Afghanistan. By all standards, the achievements made thus far reflect tremendous success in Afghanistan. Today a greater part of Afghanistan is secure from terrorism and violence. The fight against terrorists and extremists continues. Thanks to the support of our international partners, our security forces have become stronger and more effective. The Afghan national army has reached 58,000 and assumed a greater role in the fight against terrorists seeking to destabilize Afghanistan and the region. With the support of our international partners we have dismantled more than 120 terrorist bases of operations and apprehended 1,000 terrorists, including foreigners. Among the captured are elite commanders of the Taliban and Al-Qaeda’s rank and file, as well as the culprits of recent terrorist attacks. They include terrorists who carried out the attack on the Serena Hotel on the 14th of January, and the suicide bombings in Kandahar which took place last month. In spite of our achievements, significant challenges remain. Providing security for our people is not only our main objective, but also our primary challenge. Terrorists have increased attacks against civilians, schools, religious figures, security forces and international partners. They have also broadened the scope of their activities in the region. New violent fronts have been opened. Attacks which have come by “hit and run” tactics should not be seen as a sign of the enemy’s strength, but rather of their frustration resulting from the inability to engage in direct battles. 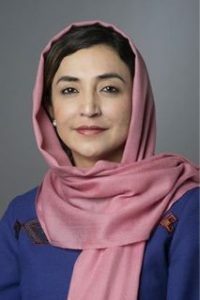 As it was stated in paragraph 19 of the Secretary General’s report, [and I quote]“The superiority of Afghan and international forces in conventional battles has forced opposing groups to adopt small-scale asymmetric tactics largely aimed at Afghan National Security Forces, and in some cases, civilians: improvised explosive devices, suicide attacks, assassinations, and abductions” [end of quote]. The government of Afghanistan will spare no effort to improve security for its people. In this regard, we continue to maintain a comprehensive strategy which contains both military and political dimensions. While the military campaign remains the center-piece of our efforts to defeat terrorists and consolidate security, we are according greater attention to political outreach and furthering the national reconciliation process. We reiterate our call to individuals with past grievances to reject violence, abide by the constitution, and join their fellow compatriots in rebuilding their country. In this connection, we welcome UNAMA’s readiness to extend its good offices to support reconciliation efforts, at the request of the Afghan government. illegal armed groups, police reform and counter-narcotics. The Government of Afghanistan has taken numerous measures to combat corruption. These include the creation of an Inter-Institutional Commission, headed by the Chief Justice of the Supreme Court, to address corruption in the public sector; development of the draft of our National Anti-Corruption Strategy, and the signing of the UN Convention against Corruption in August 2007. Nevertheless, the challenge of fighting corruption and strengthening the rule of law requires time and resources. We welcome UNAMA’s new emphasis in support of our efforts to strengthen the governance and the rule of law. link between terrorism and narcotics, we will provide force protection for eradication operations. Among other measures taken for a more effective counter-narcotics effort, our National Assembly confirmed the candidate for the post of Minister of Counter-Narcotics just two weeks ago. Despite our challenges, Afghanistan is continuing its reconstruction and social and economic development. Today, more than 85 percent of the population is covered with basic package of health services. Progress in the education sector has enabled nearly six million children access to education. Our legal economy has grown by an average of 12 percent over the past four years, and our GDP per capita has approximately doubled. Five million Afghans have returned home in hope of a promising future, and more than 1,471 kilometers of roads have been built and 737 kilometers remain under construction. In the area of human rights, our constitution has enabled our citizens to enjoy unprecedented rights. In accordance with our National Action Plan for Women (NAPWA), Afghan women continue to assume a greater role in the social, political and economic life of the country. Nevertheless, we acknowledge the challenges in various sectors, and remain committed to address them resolutely. To consolidate and advance our gains, we will finalize the Afghan National Development Strategy (ANDS) in the weeks to come. 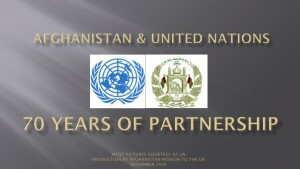 We welcome the up-coming Paris Conference in June 2008, at which we will launch the ANDS, review the implementation of the Afghanistan Compact and discuss the way forward with our international partners. We are working closely with the government of France in preparation of the Conference. The people of Afghanistan continue to live under difficult humanitarian conditions. The situation has exacerbated with the onset of the harshest winter conditions in more than thirty years, which caused more than 900 fatalities, while hundreds of people suffered from severe frostbite. The severe weather also devastated our livestock, which is the main source of livelihood for vulnerable families in remote parts of Afghanistan. While expressing gratitude to the humanitarian community for providing emergency aid in the worst-affected provinces, we appeal for urgent delivery of additional humanitarian assistance. The recent winter catastrophe illustrates the need for greater coordination of international humanitarian assistance to better address the humanitarian needs of our people. In this connection, we welcome UNAMA’s continued coordinating role to ensure timely and effective delivery of humanitarian assistance, as well as its readiness to assist the government of Afghanistan to create conditions conducive for the voluntary, safe, dignified and sustainable return of our fellow Afghans from abroad. The role of the United Nations remains vital for the implementation of the Afghanistan Compact. We look forward to the adoption of the resolution that will extend the mandate of the United Nations Assistance Mission to Afghanistan (UNAMA) in the coming days. The extension of the mandate will reflect the continuing commitment of the UN and the international community to Afghanistan. We are hopeful that it will also mark the beginning of a strengthened, structured and more effective UN role in Afghanistan. The need for greater coordination of the international community’s reconstruction efforts in Afghanistan is ever more evident. In this regard, we underscore the importance of an enhanced coordinating role by the UN to combine the international community’s assistance to Afghanistan into a cross-alliance effort. Such coordination is necessary to improve the effectiveness, and efficiency of international assistance to Afghanistan. Before concluding, I would like to express my appreciation to the United Nations and the international community for its commitment to achieve lasting peace, security and stability in Afghanistan. Together, we have come a long way, but our mission has yet to be accomplished. With greater coordination and closer cooperation, we will successfully conclude the journey which we jointly embarked upon six years ago.